I have used the Minimed 630G Insulin Pump System by Medtronic for the past 30 days. This review is my opinion of the pump, both positive and negative. I have used insulin pumps since I got my first Disetronic H-Tron V-100 in 1994. I got a Minimed 506 pump in 1998 and have been a fan of the Minimed/Medtronic pumps since. Until now. The Minimed 630G Insulin Pump System comes with the pump, the CGM transmitter, and a Contour Next Link 2.4 blood glucose meter. The three devices work well together, once set up right. Medtronic also has an early access program. This lets you buy the Minimed 630G now, and upgrade to the upcoming Minimed 670G in spring of 2017. The 630G Pump comes in several boxes. The pump comes in an 8″x10″x2.25″ box that has the pump and several small items like clips, batteries, a manual, and a quick start guide. Another box of the same size has the Contour Next Link 2.4 meter. A second box arrived a few days later with the infusion sets and reservoirs, followed by another box a few days later with the CGM sensors. I got another box a week later with the CGM transmitter. In the past, the local Medtronic trainer would call me to train me on using the pump, with a request not to use it before the training. I normally ignore this request, since I have used Minimed pumps for so long. I do go to these trainings every once in a while, but I was never contact this time. Unusual, considering how new this version of the pump is. Even so, the pump was fairly easy to set up. I also got a pile of 8.5″x11″ manuals. One was a “previous pump users manual” and one was a “pump users manual’. There was a large manual in the box that had everything in it. And another “how to use the CGM” manual. Quite difficult to find the information needed to set up and use the pump, if you do not already know the basics of Medtronic pumps. The pump itself has things I like, and a lot of things I do not like. Overall, it is a nice looking pump. You can see an overview of some of the positive things about the pump at this link. The color screen is a positive, and is much easier to read in all light conditions. The screen has three sections, you can select to get more detail. This is especially nice on the CGM part of the screen (the center). It will give you a larger display that is similar to the landscape display of the Dexcom G5 mobile application. When your blood sugar goes low, the pump will stop delivering insulin to you. When this happens, the pump has an orange highlighted section displayed to help you adjust your basal rate. The display also shows you your current blood glucose level, and a trend arrow if you are rising or falling. Selecting the top section of the screen gives you battery status, sensor status, amount of insulin in the reservoir, and days to empty. All nice stuff. The screen also displays the menus. There is goodness here, and is also where the negatives start. The menus are easy to navigate, and most of them make sense. A few are confusing at first, but make sense after you figure them out. Some of the items, like “Event Markers” are nice, but lacking. You can mark events like “Food” and “Injections” including carbohydrates and units injected. These items then display in reports in Carelink. I used “injections” for my Afrezza doses. What I do not like is that they are not reflected in “Insulin on Board”. You cannot set custom reminder names. The ones in the device are general names like “Medication”. If I want to set a new rate at 3:00am, when I change the 6:00 time to 3:00, I lose the settings for 6:00. This means you have to re-enter all the settings going forward. This greatly improves entering and changing basal rates a lot. I still do not like using arrow keys to increase and decrease numbers. Tandem’s idea of a keypad entry still beats this hands down, in my opinion. One of Medtronic’s selling points for the 630G is that it is easier to read with a portrait mode display. I do not recall where I saw it in documentation, but the rep told me this as well. To this, I call BS. I find I must un-clip the pump and pull the tubing out of my pants to read the display. This is inconvenient, and requires me to tuck the tubing back into my pants afterwards. Once or twice this was ok, but constantly doing it on every alarm, reminder, or event was too much. The original horizontal display was more convenient. I contacted Medtronic about this and they told me they have had many complaints about this issue. They might release a firmware update with auto-rotate “eventually,” but “no promises”. This was the deal killer for me, and why I arranged to return the 630G. Since you cannot update the firmware on the Medtronic pumps, I will wait to see if the 670G gets auto-rotate. Another deal killer for me is the overly complex display lock. Medtronic says this is FDA mandated for all insulin pumps. I know of screen locks on other pumps, but most can be learned and “blind entered” by the user. The 630G makes you press the “Select” button, then a random selected arrow button. This means you have to look at the display to unlock it. It is inconvenient during the day, and makes dealing with nighttime alarms a pain. Every alarm requires unlocking the display. Every access to the menu requires unlocking the screen. Everything requires unlocking the screen. Bad. The Minimed 630G uses the Enlite CGM sensor. 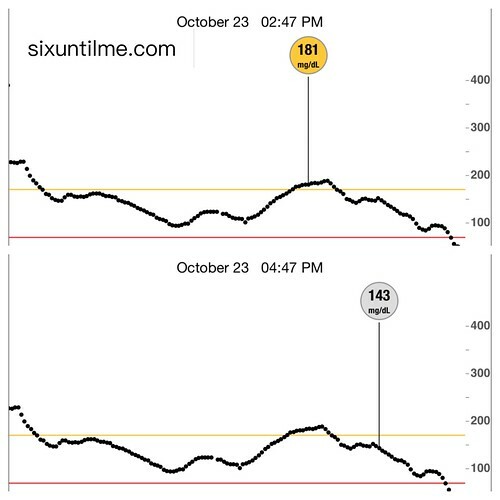 On the 530G, I found it was fairly accurate in a side by side comparison with the Dexcom G5. That was using the Minimed 530G pump, the MiniLink transmitter, and the Enlite sensor. I would have expected similar results with the Minimed 630G pump and CGM. Unfortunately, I found it to lag behind the Dexcom in detecting lows and highs. I also found its readings were consistently lower than the Dexcom. It would often go into suspend while the Dexcom (and a verification meter check) indicated a well within range reading. A calibration blood glucose entry takes several minutes to actually calibrate the pump. Readings continue for a short time, but then stop. The 530G pump was quick to adjust to new entries. The Guardian CGM transmitter looks exactly like the older MiniLink transmitter, except it has a G on it. I tried to link an unused MiniLink transmitter to the 630G but was not able to. They changed frequencies in the pump which broke the Connect key fob. My guess is that is the culprit here, too. The transmitter auto connects to the pump, which makes pairing easy. By the way – there is no way to display the CGM data on an iPhone. The 530G pump had this feature. That is a step backwards for me. The local Medtronic rep told me “maybe in the future”. Another interesting “look alike” is the Contour Next Link 2.4 meter the Minimed 630G uses. It is nearly impossible to tell it apart from the Contour Next Link used with the Medtronic 530G. I had several warnings to make sure I was using the right meter to try upload to Carelink. Again, the frequency is different on the pump. The new meter auto pairs to the pump like the CGM transmitter. Thus it is easier to connect than the old system of manually entering a serial number. My guess is the frequency changes are to Bluetooth, which is a 2.4Ghz radio frequency. Thus the 2.4 in the meter name. A few words on Carelink, which is the website you upload your pump data to. Carelink has always been problematic. It remains so. Though it is a good site when it works, it requires older versions of operating systems and web browsers. It requires its own device drivers, and even then it is “iffy”. I was unable to upload the new pump to Carelink on my Macbook Air. The local Medtronic rep blamed my operating system and browser. However, it does upload my 530G, so I know that is not the problem. I could upload running Windows 10 in a virtual machine, but that is inconvenient for most people. One thing I will still give Medtronic is their exceptional customer support. They are 100% behind giving customers the best support possible. They do have a 30 day return policy for new pumps. If you try the pump, and do not like it, you can ask to return it. I made a request to return my Minimed 630G, but they have to get “written permission” from the field rep. That has not happened yet, so I had to call insurance to cancel payment to them. Not that I do not trust Medtronic, but I have not had a good experience with my local representative. I have had exceptional experiences with local representatives in the Seattle area though. In summary, the Minimed 630G insulin pump system has a lot of nice features over its predecessors models. The portrait mode display is a disadvantage, and the CGM is not very accurate. Note also that the 630G is a bit larger than the 530G. It pokes me in the side more. Not a problem during the day, but at night it is uncomfortable for me. The other thing I should note is that they will only send you 300ml reservoirs for the pump. I only need 80 units for 3 days, so I prefer the 180ml reservoirs. A “special prescription” was needed to get the 180ml reservoirs with the 630G. I like the Minimed 630G Insulin Pump System, but it is not for me. If the display had auto-rotate, I would keep it.